The UN Secretary General Ban Ki-Moon made it clear that the United Nations will not monitor human rights in the Western Sahara and does not intend to modify the terms of its mediation in this long lasting regional conflict. “The United Nations does not intend to modify the terms of its mediation, whose purpose is to promote the achievement of a mutually acceptable political solution to this conflict,” Ban Ki-moon said Saturday during a phone call with King Mohammed VI of Morocco. The UN chief reaffirmed that his Personal Envoy, Christopher Ross, and his new Special Representative and head of the U.N. mission in Western Sahara, Wolfgang Weisbrod-Weber, will fulfill their respective mandates in promoting the negotiating process … and in supervising peacekeeping activities within the framework set forth in successive Security Council resolutions and in his instructions. This clear-cut statement as to the mission of the UN Personal Envoy and of the head of the MINURSO will undoubtedly bring the negotiations process out of the roadblock it reached after Morocco withdrew its confidence in the UN Secretary General’s personal envoy for the Sahara, Christopher Ross, for being unbalanced and biased in his attempts to mediate a solution for the disputed territory between Morocco and the Polisario separatist group. Insiders comment that this breakthrough was made possible thanks to King Mohammed VI who had been personally very active on the diplomatic front to defuse the tension and bring the negotiations process back on track. 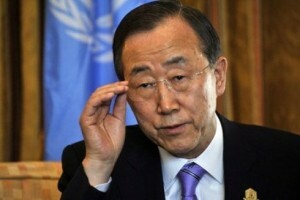 Commentators underline, on the other hand, that the UN Secretary General clearly mentioned Algeria as a party to the conflict when he reaffirmed that his Personal Envoy and his new Special Representative will fulfill their respective mandates also “in encouraging further improvement of Moroccan-Algerian relations”, as put by U.N. spokesman Martin Nesirky. The Western Sahara conflict broke in 1975 when Spain withdrew from the territory. Since then, Morocco and the independence-seeking Polisario have vied for control of the former Spanish territory. Morocco’s claim to sovereignty over the Western Sahara is based largely on a historical argument of traditional loyalty of Sahrawi tribal leaders to the Moroccan sultan. The Polisario, backed by Algeria, claims to represent the aspirations of the inhabitants of Western Sahara for independence. To settle this longstanding conflict, the Polisario demands the organization of a self-determination referendum, deemed by many observers as impracticable, while Morocco has made in 2007 a proposal to grant the territory a large autonomy under Moroccan sovereignty. The proposal, known as the Autonomy Plan, was welcomed by world powers and by the Security Council as serious, credible and realistic. During the phone talks with Ban Ki-Moon, the King of Morocco renewed his country’s sincere, voluntary and constructive willingness, which relies substantially on the advanced autonomy proposal that the international community welcomed as a serious and credible means to end this conflict. The UN tried and continues to explore with the parties ways of arriving at a mutually agreed political settlement. Since August 2009, nine rounds of unofficial UN-brokered negotiations were held between Morocco and the Polisario Front with Algeria and Mauritania attending as observers but progress has so far been elusive. Written by: Peter Mulvany on August 27, 2012. Last revised by: , our reviewer, on August 28, 2012. Posted by Peter Mulvany on Aug 27 2012. Filed under Headlines, World News. You can follow any responses to this entry through the RSS 2.0. Both comments and pings are currently closed.